Seven months ago, European health regulators lifted a similar warning on the drug, called Champix in Europe. Pfizer failed to convince the FDA to remove the black box warning in 2014 after the agency decided to wait for more trial data. The company has spent opulently on advertising and settling Chantix-related lawsuits. It’s important to note – while not defending Chantix – that quitting smoking in any fashion can cause major withdrawal symptoms, including irritability, mood swings, and depression. Additionally, psychiatric conditions are more common in smokers than in non-smokers. But FDA scientists weren’t completely satisfied with the panel’s assessment and flagged numerous inconsistencies in data collection. After removing the inconsistent data, the trial results appeared to coincide with Pfizer’s conclusion. 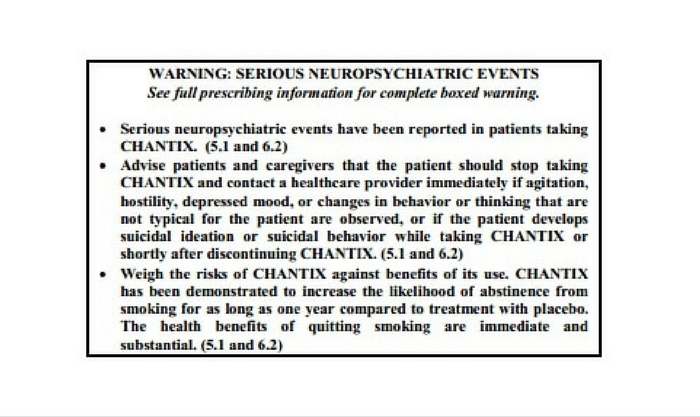 Though Pfizer was allowed to remove the black box warning, the FDA said the Chantix label should contain the post-marketing reports of the serious side effects linked to the drug. Additionally, the FDA required that the Chantix label mention that the drug was more effective than other available smoking-cessation therapies. Thousands of lawsuits have been filed over Chantix on behalf of users who allege the drug made them depressed, angry and, most often, suicidal. Albrecht had been taking Chantix to quit smoking in an effort to save his singing voice. He began experiencing personality changes and vivid dreams almost immediately, according to his girlfriend. In another horrifying case, a jail inmate sued Pfizer claiming Chantix made him gouge his eyes out while behind bars in 2014. Michael Shabsis began taking Chantix in 2013 to quit smoking.